Here’s a new shape for the big boys (you know who you are!) I call it the “Zinger” and it was inspired by my conversations with customer Sean, who needed more performance than his 7-10 was offering him. Like all my shapes, I created the design in AKU and sent the PDF to Sean for review. 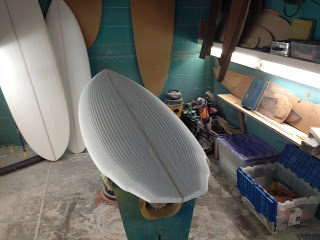 While I hand-shape 90% of my boards, I like to use CNC technology on my more technical EPS foam shapes. The nature of the material makes CNC a better choice. Once we were both satisfied with the shape, I sent the file to Marko Foam, who cut the EPS blank on their CNC machine. Blanks was delivered today. After machining, the blank has the look of corduroy, with grooves left from the cutter head. Sanding and screening leaves the blank ready for glassing. The Zinger is a hybrid shape with a fairly full outline and flat rocker. The dimensions of this particular model are 7’2″ 15-3/4″ x 23″ x 17″ 3-3/8″. I used a sloped-rail design to keep the rails thin, and added double-wings in the tail, to reduce tail width. The flatter rocker will help to keep Sean from pushing water while paddling, the full outline will give him maximum planing surface, the sloped-rail will allow him to penetrate the wave face for better hold, and the bump/wing tail will make turning easier. Sean chose the 5-fin set-up for maximum versatility. This board will be glassed with S-glass cloth and epoxy resin for strength and light weight.